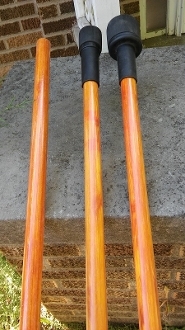 These 8'10" fiberglass spears are heavier duty for those who enjoy fighting in the thick of the melee! Stronger than our brown, lightweight spears, they also have an attractive woodgrain finish to them. Included is our 2" or 3" spear cap and tip for a complete spear kit.